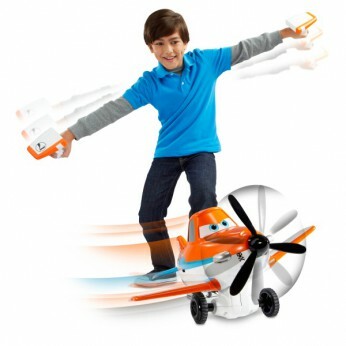 Kids can have high-flying fun recreating the action seen in the Disney Toons Studios Planes video with this RC vehicle that offers role-play remote control so the plane moves when they do! Push the button to set its propeller spinning and move it forward, then use the two controllers – one for each wing – to tilt the wings and control its movement through mimicry. Sounds and phrases amp up the action for a thrilling air-venture! This toy costs approximately £37.99 (for the latest and best prices make sure you check our retailer list for the Cars Planes Tilt and Fly RC Dusty above). In our review of Cars Planes Tilt and Fly RC Dusty we classed it as being suitable for ages 3 years, 4 years, 5 years but recommend you check the manufacturer specific advice before purchasing.